Friday, April 7 ended up being a day of living my social activist values. 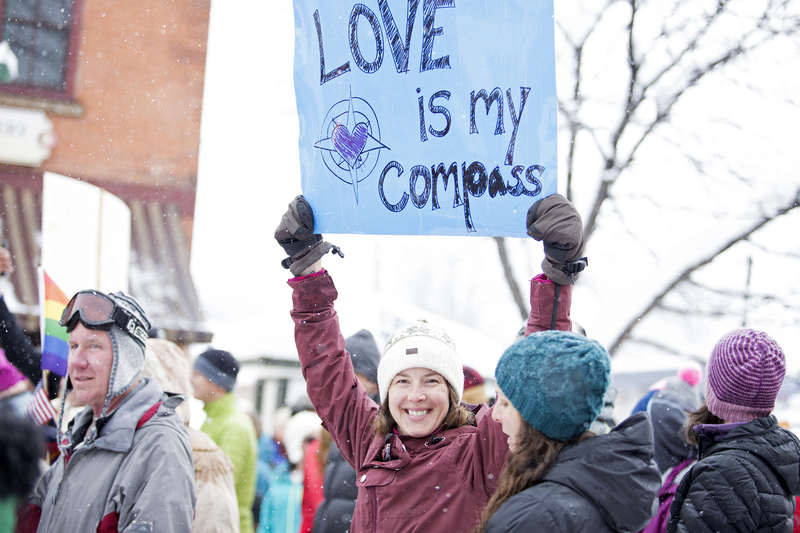 I was invited to give a short presentation to a sociology class at Fort Lewis College about my work organizing the Standing on the Side of Love March, which took place in Durango on Saturday, January 21, 2017. Despite receiving more than a foot of snow that Saturday morning, which trapped many people at home (unable to leave their driveways or navigate unplowed roads into town) — over a thousand people still attended that march. The event covered the front page of The Durango Herald the next morning (you can read an online version of the article here) and I delivered a speech to the crowd, which you can find on the Facebook page for the march, following the link here. I had no idea how many procedures and requirements were involved with organizing a project like that, and I’ve shared information with many people since then — but Friday was my first time speaking in front of a class full of college students about those details. My friend Hannah Dzubinski — who designed the march posters, social media pages, and spent hours and HOURS of time with me, working hard to make that march happen — Hannah came to the sociology class with me, because we are a TEAM and the Standing on the Side of Love March was an event we are both extremely proud of. 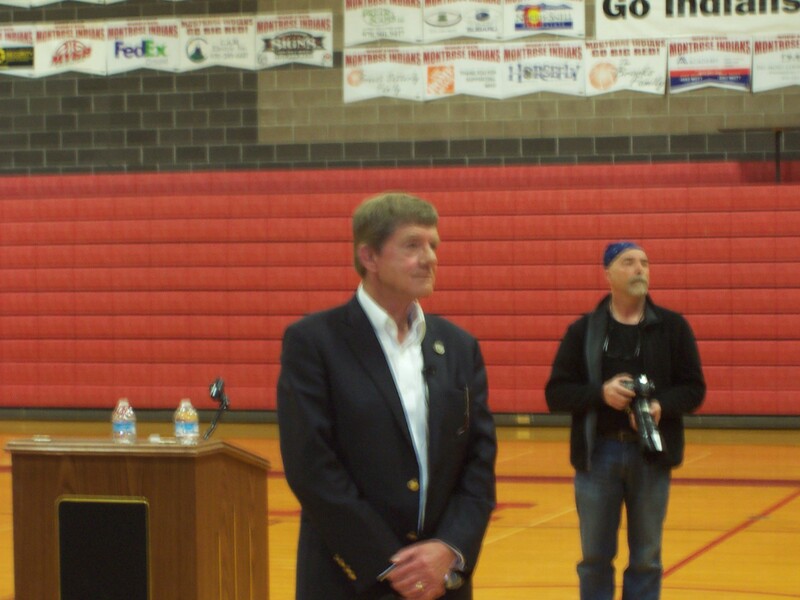 Right after the class finished, we jumped in my car and drove 2.5 hours to Montrose, Colorado, to attend a 6:00 p.m. Town Hall with our District 3 U.S. Representative, Republican Scott Tipton. “Fractious town hall for Tipton” is the headline beneath a photograph of Representative Tipton speaking in front of a large crowd in the Montrose high school gym. One staff member commented that this was the largest attendance for a town hall in Montrose they’d ever had. People are fired up with anger and fear about the state of the country right now, and Representative Tipton sure got an earful about climate change and health care last night. He also witnessed lots of feet-stomping, clapping, whistling, yelling, and chanting. Like other recent town halls I’ve seen on TV, this one was full of people who are worried about losing health care, and people who are REALLY worried about climate change ruining all of our lives. Also strongly disliked: the current administration’s ideas about building a wall along the U.S. border with Mexico. At one point during the two hours in which Representative Tipton answered questions, the audience yelled, “No wall! No wall! No wall!” for quite some time. I think there were maybe six people in that entire gym who were Republicans. The rest were all Democrats, libertarians, independents, and people who ride around on unicorns, like me. My sincere apologies that my camera is so non-good with distance photographs taken indoors. Maybe I will get a clue one day and buy a new camera. As long as I don’t have to dismount Princess Sparkles, of course. Because God forbid I do anything without my unicorn, mystical steed of special snowflake magic. Representative Tipton stated he is against the Paris Accord. He also said he has “core values” that will never change. He did a very nice job facing this large, raucous crowd in the Montrose high school gym. I hope to attend another one of his town halls. He is a good man and I believe his heart is in the right place. But my core values do not match his. I believe that the burning of fossil fuels is creating global warming as well as ocean acidification, and if human society does not change our ways, we are on a path to extinction. Representative Tipton disagrees.